Autumn is just around the corner. I swear, I can feel it. I did a double-take this morning when I saw a few golden leaves on the Chinese Pistache tree in the front yard; then this evening, a storm blew through and it rained and the weather cooled a bit and I got that familiar excitement again. Fall is coming. Time for roasted things! Hot soup! Turkey Day! It will be here before you know it! 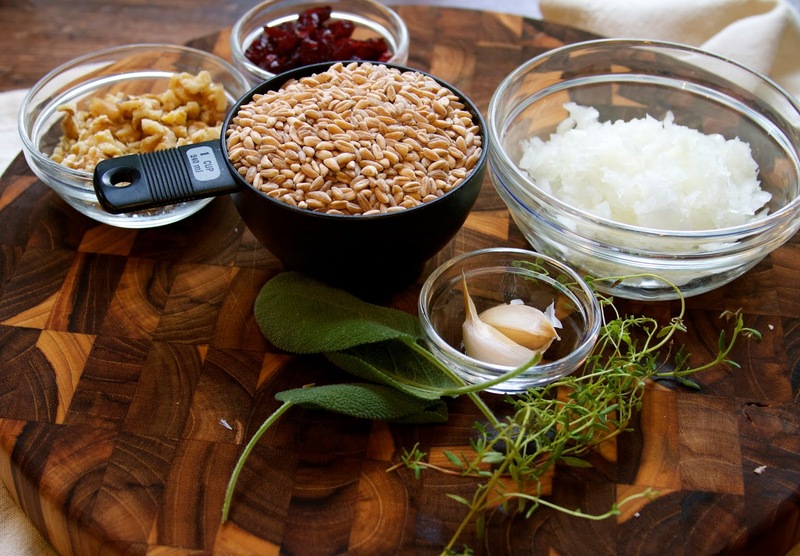 I think I’ve mentioned how much I love farro. 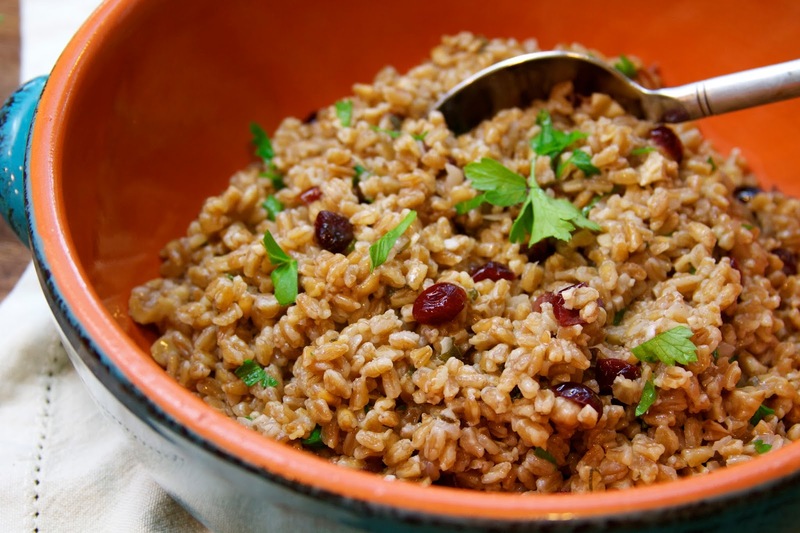 I love its nutty flavor and chewy texture and it’s a great alternative to rice. 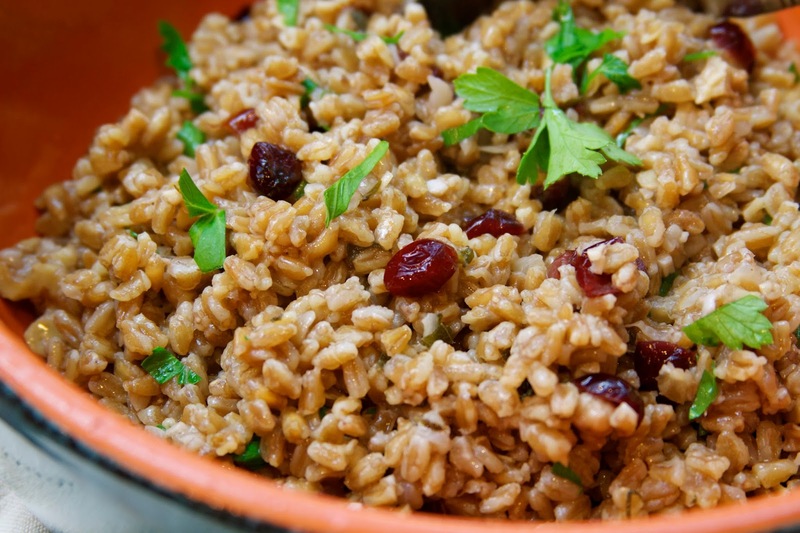 This farro pilaf is so easy and it makes an elegant side dish. 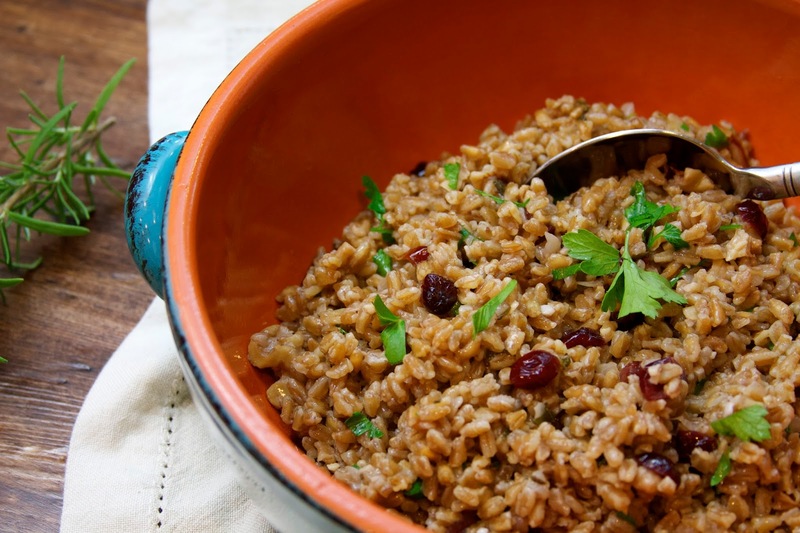 This pilaf even makes an amazing stuffing for cornish game hens! The drippings from the bird make it even more delicious! There is so much flavor in this dish–from the sage and thyme to the toasty walnuts and tart dried cranberries. It really just speaks Autumn and I love it! I always buy “pearled” or “semi-pearled” farro, which takes less time to cook than whole farro and doesn’t require soaking. It can be found packaged or in bulk in specialty markets, like Whole Foods Market and I’ve also seen it at Costco. In a medium saucepan, heat about 1 to 2 tablespoons olive oil. Stir in the chopped sage and thyme and cook until fragrant, about 1-2 minutes. Add the onions and garlic and cook until translucent, about 3 minutes. 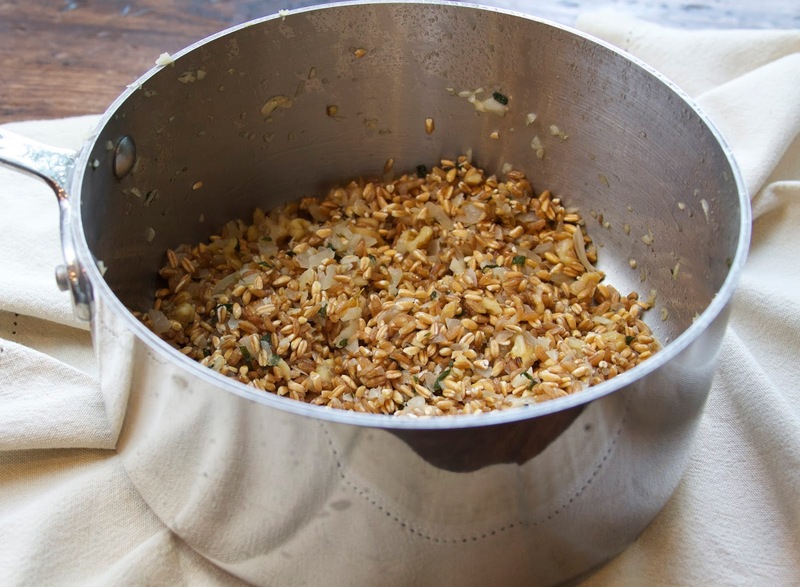 Add the walnuts and the farro. 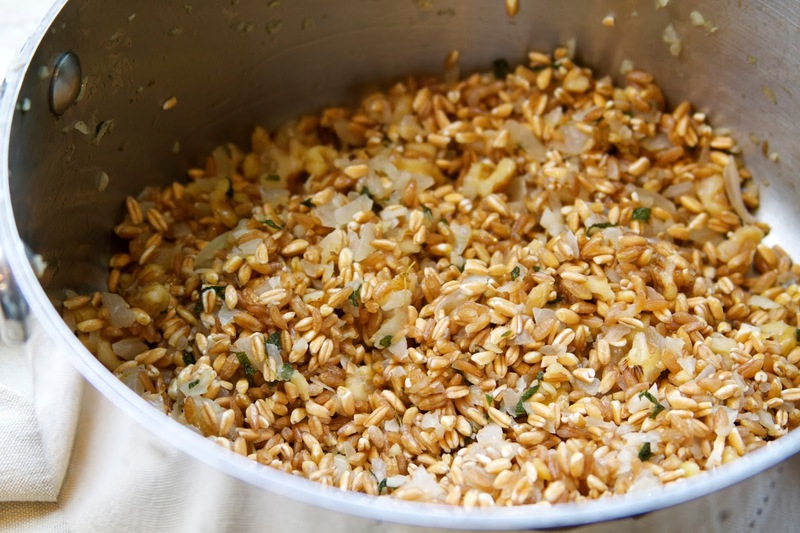 Sauté until the farro is coated with the olive oil and is lightly toasted. Add the chicken stock and season with a pinch of salt and pepper. Bring the mixture to a boil, then reduce the heat to simmer and cover. Cook for approximately 25 minutes and then add the dried cranberries. Cook for an additional 5 minutes or until all of the liquid has been absorbed into the grains. 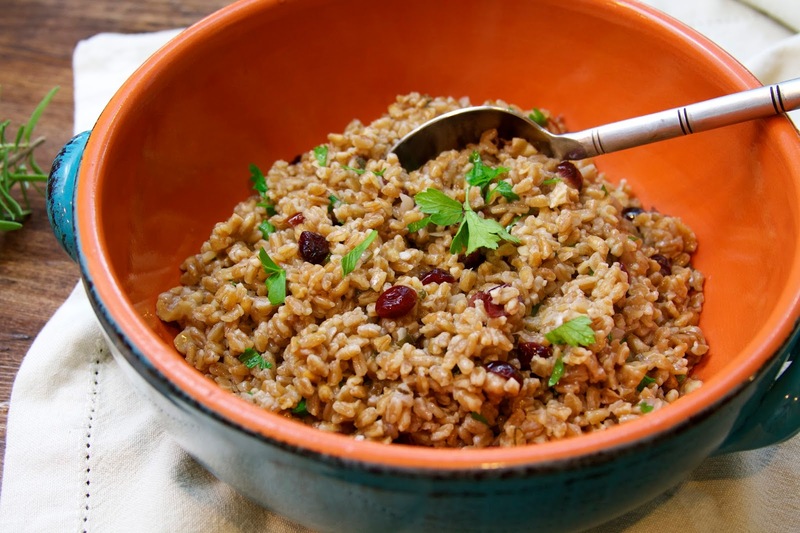 Remove from heat and allow the farro to settle in the covered saucepan for about 5 minutes before serving. I finished the pilaf with a squeeze of fresh lemon juice and some chopped parsley to give it a little brightness and lift. That’s it! It’s that easy, and I hope that you will try this the next time you need a side dish for a warm, Autumn meal!